FAIRFAX, VA--(Marketwired - Aug 13, 2015) - High-achieving organizations and executives around the world have been recognized as Gold, Silver and Bronze Stevie® Award winners in The 12th Annual International Business Awards, the world's only international, all-encompassing business awards program. Nicknamed the Stevies from the Greek word "crowned," the awards will be presented at a gala event on Friday, 23 October at the Ritz-Carlton Hotel in Toronto, Canada. Tickets for the event are on sale now at www.StevieAwards.com/IBA. Gold, Silver and Bronze Stevie winners were selected from more than 3,700 nominations received from organizations and individuals in more than 60 nations. All organizations worldwide are eligible to compete in The International Business Awards, and can submit entries in a wide range of categories, including management awards, company of the year awards, marketing awards, public relations awards, customer service awards, human resources awards, new product awards, IT awards, web site awards, and more. The top Gold Stevie Award winners this year are MSLGROUP worldwide, with 10; Weber Shandwick worldwide with eight; Accenture (USA) and LLORENTE & CUENCA (Spain) with six; CallidusCloud (USA), DHL Express globally, Dubai Statistics Center (United Arab Emirates), Hanaroadcom (South Korea), and the PJ Lhuillier Group of Companies (Philippines) with five; and boogy the event company (Turkey), Kale Group (Turkey), Plasenta Conversation Agency (Turkey), and Strategic Public Relations Group (Hong Kong) with four Gold Stevie wins each. Winners of three Gold Stevie Awards include the Abu Dhabi Tourism & Culture Authority (United Arab Emirates), Agiliance Inc. (USA), Bahrain National Gas Company (Bahrain), Cisco Systems (USA), Dubai Police H.Q (United Arab Emirates), Ooredoo (Qatar), PT Telekomunikasi Indonesia (Indonesia), Roshan, (Afghanistan), RSA Insurance (Canada), the Seegene Medical Foundation (South Korea), TangoMe (USA), Thai Life Insurance Plc. (Thailand), Veeam (USA), and WNS Global Services Pvt. Ltd. (India). A complete list of all 2015 Gold, Silver and Bronze Stevie Award winners by category is available at www.StevieAwards.com/IBA. "We are pleased to once again honor many of the world's best organizations, professionals, and their achievements," said Michael Gallagher, president and founder of the Stevie Awards. "This year we've seen that organizations around the world, and especially in emerging markets, are becoming much more skilled at summarizing and evoking their achievements in award nominations. I know it has been a delight for the judges to read and comment on these stories of success, and we look forward to honoring on stage the Stevie winners who join us in Toronto on 23 October." During the week of 24 August the winners of the Best of the IBA Awards, five best-of-competition prizes, will be announced. Winners will be determined by a tally of the total number of Gold, Silver and Bronze Stevies won by organizations, and will be presented with Grand Stevie Award trophies in Toronto. 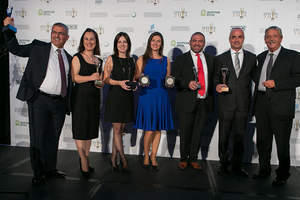 Some of The International Business Awards winners from last year. This year's ceremony will take place in Toronto on October 23.